Another Friday is here! There is no sign of germination where we planted seeds last week, so I’m beginning to get a little concerned. I haven’t done a great job of keeping the soil moist, but then it was covered with snow for part of the last week. I’m hoping that it is just the cold weather (keeping the soil cold) that is delaying germination of the typically quick-germinating radishes. It is so weird to have a late spring! 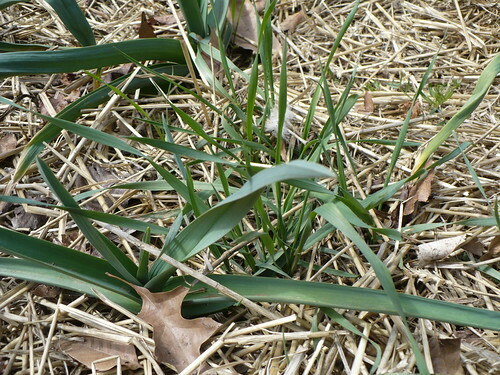 Here’s a quiz for you…how doe you tell if what you are seeing is grass or garlic or shallots? This picture isn’t too difficult to distinguish, but when the garlic or shallots are smaller it can be a real challenge! The garlic leaves usually feel thicker and waxier to me than grass, and of course, they smell like garlic too! 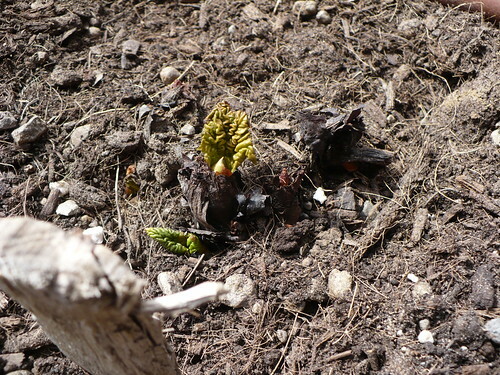 The rhubarb crown they planted a couple weeks ago is starting to slooooowly put on some growth. I could be wrong, but I think these leaves look like they got a little more cold than they would have preferred. 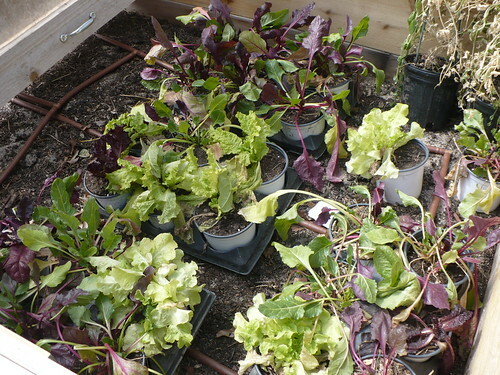 Speaking of cold, the lettuce and chard in our cold frame got a little more cold than they would have strictly preferred this week, since we left the cold frame completely open when it got so cold earlier this week. Somewhat surprisingly, they really don’t look that much the worse for wear! This is the obligatory “before” picture. 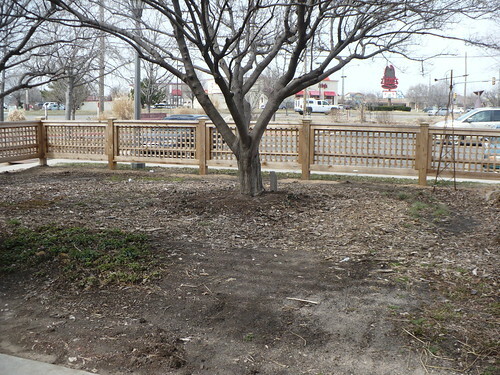 Rumor has it that we are going to be starting work on this shade garden this week. If nothing else, the compost has to move from the parking lot into the garden, since the farmers’ market is starting a week from tomorrow! My light stand looks like a forest of plant labels right now! By next Friday I hope it will look like a forest of small tomato, eggplant, and pepper plants! 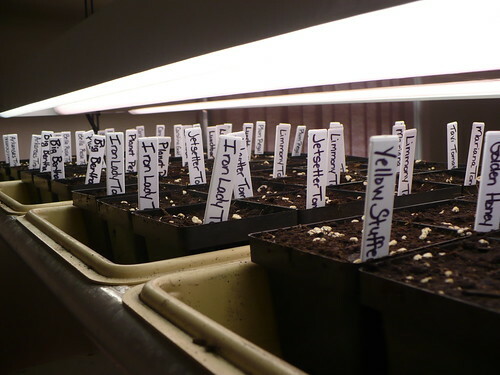 Posted on March 29, 2013, in PhotoEssays and tagged cold, flowers, garlic, rhubarb, seed starting, seeds, shade garden, Spring, weather, weeds. Bookmark the permalink. Leave a comment.